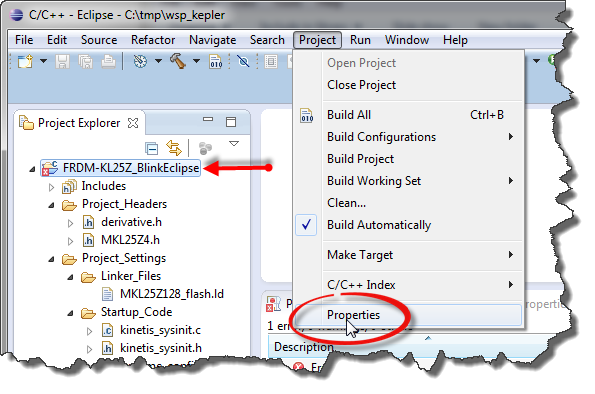 This is the second part of a multi-part tutorial about how to set up an open source tool chain with GNU ARM gcc + Eclipse to build and debug an application for Kinetis ARM devices. ❗ If you plan to use Eclipse with Processor Expert (what I recommend anyway ;-): Eclipse Luna is *NOT* supported in Processor Expert 10.4! Eclipse Luna is expected to be supported in Processor Expert 10.5 coming out in 2015! 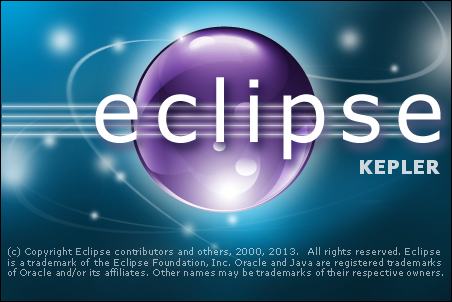 So if you are using Processor Expert 10.4, then make sure you are using Eclipse Kepler. In my previous post I showed how to use the ARM GNU tool chain to compile and build an application for the FRDM-KL25Z board. I was not using a special editor or IDE: a simple thing like Notepad is what is needed. Of course you can use any text editor. However, while using Notepad or similar plus make files is fine for small projects, using an IDE will greatly improve productivity. I’m adding here the Eclipse IDE, as I use it for many of my projects. While Eclipse for sure cannot meet the needs of everyone, it is today a de-facto standard in my view. Many vendors today deliver their tool chains bundled with Eclipse, and most of the time this is a modified version of Eclipse. While this is not wrong, it always takes time for the vendors to adopt to the latest and greatest version of Eclipse. So instead of waiting, using my steps you can add the most recent version of Eclipse to the ARM gcc from the first part of this tutorial. 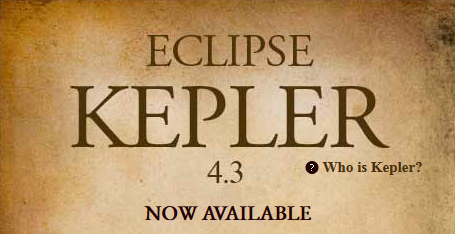 At the time of this writing, the latest Eclipse version has the code name ‘Kepler’. And this is what I’m going to install. ❗ This is not a tutorial on Eclipse itself. It is expected that you have basic IDE and especially Eclipse knowledge. Unpack the archive into into a filder, e.g. into “C:\Freescale\Kepler” so you have a folder structure like “C:\Freescale\Kepler\eclipse”. Of course the structure is up to you, but this way the directory structure is similar to e.g. CodeWarrior. 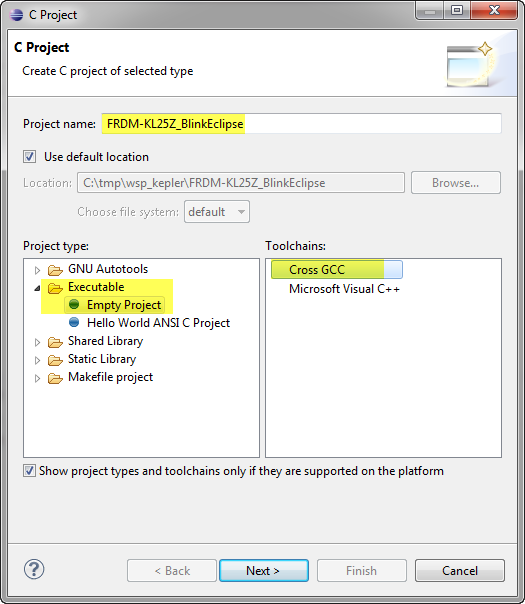 Use eclipse\eclipse.exe to launch the IDE. I recommend to add a shortcut, plus to add -showlocation to the command line (see this post). Eclipse will ask you for a workspace location. The workspace is where Eclipse stores project information and settings, and where you can have the project files. I’m going to create an Eclipse project, with the same files as I used in part one of this tutorial. 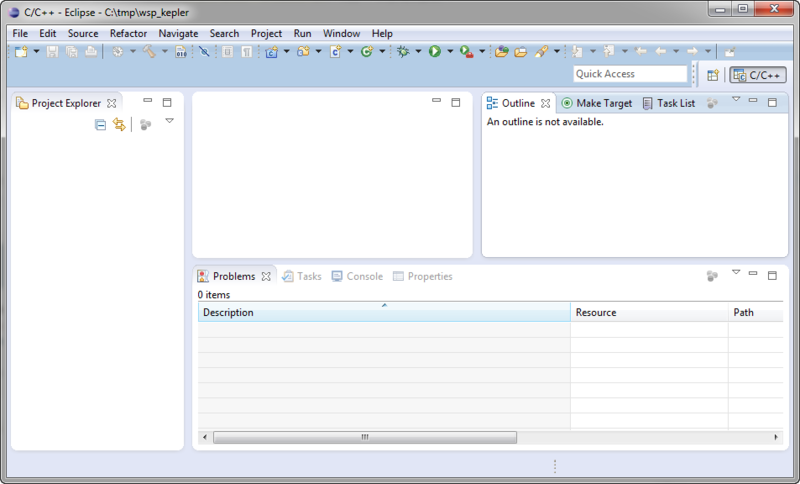 But instead of using a make file, I let Eclipse create and manage that make file. That way I do not need to ‘program’ the make file. 💡 I’m using here the standard GNU build tools integration which comes with Eclipse. 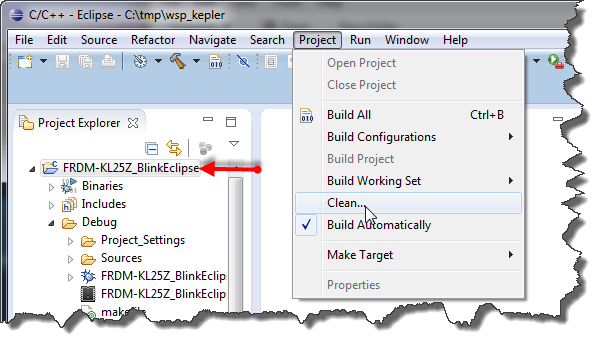 A build tools integration provides panels and more to set up compiler options and so on. The standard GNU panels are very basic, and there is a more powerful one: the GNUARM Eclipse plug-in. This plugin is very similar to the one Freescale delivers in their Eclipse based CodeWarrior. To keep things simple, I’m going with the standard GNU build tool integration and panels. Create a new project with the menu File > New > C Project. 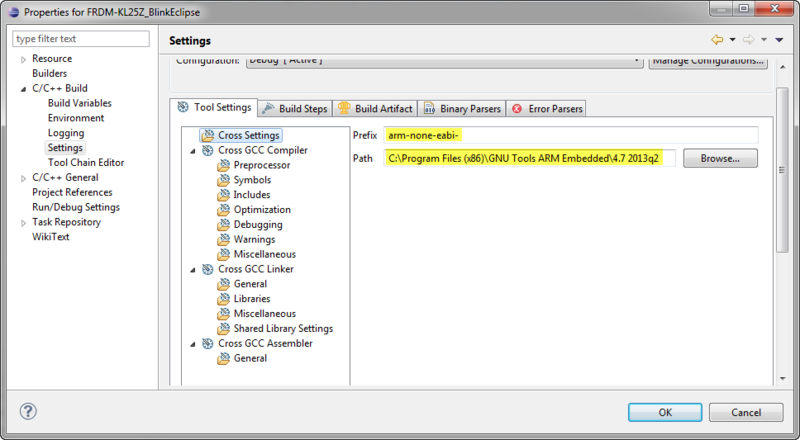 Next, you need to enter the compiler prefix (arm-none-eabi-) with the path to your GNU ARM installation from part one of this tutorial (C:\Program Files (x86)\GNU Tools ARM Embedded\4.7 2013q2, where you have ARM GNU gcc installed). You need to enter this only once (Eclipse remembers the settings for next time). Linux users use something like /home//gcc-arm-none-eabi-4_7-2013q2. ❗ There is that ‘Program “gcc” not found in PATH’ error message. Don’t worry about this one. Download the .zip file from part one of this tutorial from here. 💡 You can drag&drop the files from WinZip into the Eclipse Project Explorer tab. We cannot build the project yet, as the build tools are not fully configured yet. For example we need to tell the compiler where to look for header files, which file to generate, and so on. Go to the C/C++ Build > Settings. The Cross Settings shall have the entries we specified during project creation. If you switch later to a different GNU ARM gcc version, then you can change the settings in the dialog below. Linux users use something like “/home//gcc-arm-none-eabi-4_7-2013q2”. See this GNU ARM options for details. 💡 The Problems view reads the output of the Console View. I always trust the Console View more than the problem view, because if the build tools are generating strange or unusual error messages, they might not show up in the Problems view. 💡 The output folder cotains all the object files and generated make files. You can simply delete that output folder, and Eclipse will re-generate all the files. That might be a useful thing if you want to do do your own ‘tabula rasa’ action. As debugging is subject of the next part, you can try out the generated .s19 and download it with the OpenSDA MSD Bootloader to the FRDM-KL25Z, as we did it in part one. then this means that clean did not find the ‘rm’ command. You do not need everything. As in part one of this tutorial, copy the ‘rm’ (in the ‘bin’ folder to your GNU ARM bin folder (C:\Program Files (x86)\GNU Tools ARM Embedded\4.7 2013q2\bin). This Eclipse project is available on GitHub here, so you have a ‘working version’ in case you missed step or did a mistake. I admit that the tool chain integration is not as easy to use as e.g. the one provided in Freescale CodeWarrior or other ‘commercial’ tool chains. These tool chains come with wizards, header files and example projects which are not provided here. But nothing prevents you to get the header files/linker files/etc for your device from the silicon vendor and go from there. We are not covering debugging yet, so this will be the subject of the next part: Part 3: Setting up the debugger (GDB Server with P&E and Segger). But with this part of the tutorial you should be able to open source tools to edit, compile and link your application for the FRDM-KL25Z board. This entry was posted in CPU's, Eclipse, Embedded, Kinetis, Tips & Tricks and tagged arm gcc, Assembly, Building, Eclipse, freedom board, gnu gcc, KL25Z Freedom Board, open source projects, software, software project, technology, Tips&Tricks, tool chains by Erich Styger. Bookmark the permalink. Nice one Erich!!!! Works on linux too. Just had to change the paths in C/C++ Build > Settings > Cross Settings > Path to /home//gcc-arm-none-eabi-4_7-2013q2. cool! I expected it to work on Linux too, but as always with some small modifications. I’ll point to your comment from the main article. Anytime. Looking forward to the next installment. thank you for all the good work you have been doing so far. I’m working on the GDB server part. Found one for Windows, but will check if there is something on Linux too. Or do you know? As always, a very useful post! I have a doubt. In my customK70 Board I haven’t the OpenSDA MSD Bootloader interface. I only have one PE Micro connection (JTAG). Is it possible to debug with JTAG (PE Micro) without CodeWarrior? Are you having a P&E Multilink? If so, yes, this should be possible. I’ll probably publish article number 3 on debugging tonight or maybe tomorrow (depends how much free time I can find do write down things). OK Erich. Yes, I have a P&E Multilink. I’ll see the article number 3. Thank you for the tutorial, Erich. I have one question. Shouldn’t objcopy be used with “srec” as the output format, instead of “ihex”? I understand that ihex is for “Intel HEX” format, and from what I see, P&E’s MSD OpenSDA application does not recognize the this format. In other words, I can’t load my application on KL25Z, if I use the ihex format, but the same application load successfully, if i use the srec format. Thanks again. yes, indeed, I need to fix this. srec is the correct option to write an S19 file. Thanks for finding this! 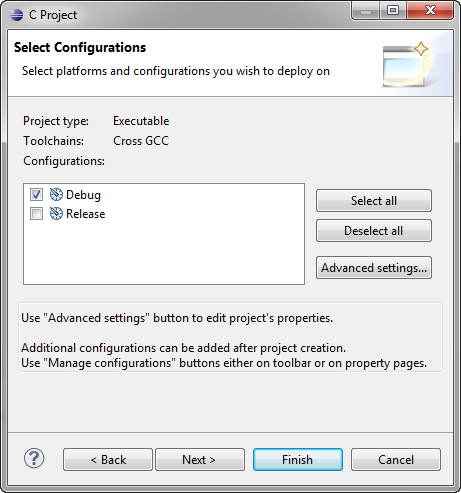 how do i configure that in eclipse? hmm, maybe I miss your point, but that file gets included automatically into the make file by Eclipse, as using manged make. I have two questions: First. When a set the compiler prefix i get two errors, one as in figure and other almost the same but it said g++ program not found in path. Second, in C/C++ Build>Settings > Tool Settings I can’t see any information about GCC Linker but G++ Linker and G++ Compiler. What can i do to put only Gcc Linker? if you get a ‘not found’ message, then you need to add it to the PATH. See about this in a later tutorial (https://mcuoneclipse.com/2013/08/03/diy-free-toolchain-for-kinetis-part-4-processor-expert-for-eclipse/). It happened to me only in this step, maybe because I had it already in my path? To remove the C++ part: Select the project properties, then under C/C++ Build > Tool Chain Editor use the ‘Select Tools…’ button. and the word ‘here’ has a link to the GNUARM Eclipse project, stored on SourceForge. For your information, CodeSourcery is not a contributor of the GNUARM Eclipse project. thanks for the heas-up. I wrongly took that conclusion because of the ‘Sourcery’ in the plugin. I’ll correct this in the post. You’re welcome! I would appreciate if you could explicitly use the name of the plug-in, for example “The standard GNU panels are very basic, and there is a more powerful one, the GNUARM Eclipse plug-in”, with the link behind the full name instead of the word ‘here’. thats a very good suggestion. I have fixed this. At step 5. Under Linker > Miscellaneous … on my cortex-m4 part, I needed to add -mcpu=cortex-m4 to get the right version of libgcc linked. Not doing this resulted in arm code (ie not thumb code) being linked in which resulted in core hard faults when using floating point. thanks for this point! I have missed that, sorry. I have it added to the post. On the linker setting you can set the cpu to cortex-m0+ with: -mcpu=cortex-m0. This needs to be done for the compiler and linker miscellaneous sections. yes, this was missing in my original post, and that information has been added this morning. Hi, first all thanks by this tutorial ! As for your problem: it is the linker who complains that it does not find __thumb_startup. This function is in my startup code (startup.S). Are you compiling this one (well, it is an assembly file)? I remember that my toolchain only accepted (not sure why?) *.S, and not *.s (lower case ‘s’). Maybe the same problem for you? I just want to say : Thank You ! This Tutorial is really good ! Thanks again for your job ! >>Bus 001 Device 004: ID c251:f002 Keil Software, Inc.
Then, I think the board is correctly recognized like a peripheral by the OS. so now I want download the s19 file to the board …..
First all thanks for this great tutorial! I tryed this on Linux. I try with -mcpu=cortex-m0 & -mcpu=cortex-m0plus and still get the same error. Have you set the cpu option in the linker settings too? The problem was I was adding in Other options(Xlinker[option]) instead that Linker flags. good news! It is not that easy to pass this option(s) to all parts of the tools. 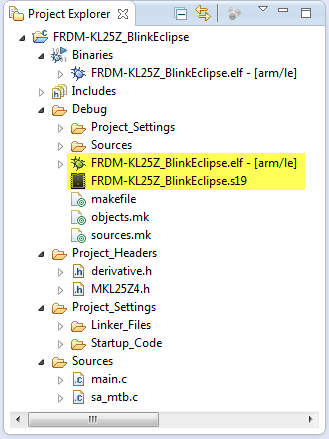 Hi, I just saw today, there is a new GNU ARM plugin for eclipse (Version 1.1.2.201310210535). The URL with install instructions is: http://gnuarmeclipse.livius.net/blog/install/. It seems very amazing, there are a lot of (new) options, including full toolchain customization. this pretty much looks like the ARM Gnu plugins in CodeWarrior. And they are are pretty good, but looks this one has even more features. I have downloaded and installed them, will take me some time to get through all the things which are news. As author of GNU ARM Eclipse Plug-in, I confirm that a new, fully redesigned, version of the plug-in is available. I would appreciate your comments, critics, suggestions, etc. excellent and great job, thanks for doing that contribution! I will check it out for sure and will post something about. Has to wait probably for the weekend or afterwards as I have another urgent assignment. No problem. But when you do, please read the documentation carefully (with a critic eye, to eventually spot any mistakes/misunderstandings!) and use the latest version available, since I’m improving it constantly. FYI: I just added some new features, C/C++ project templates to build STM32F1x and STM32F4x sample projects, based on the original STM standard peripheral libraries. thanks, I have seen the update. Still need to find some time to use it, but from the documentation the plugin looks really good. Thank you for all the work you have done in presenting this “how to” so clearly and with so many images. Much appreciated. I am using a Freescale MKL05. Not finding much support for a MacOS toolchain; running the prebuilt Freescale Eclipse on VirtualBox emulated Windows is un-useably slow. So I am trying to use Eclipse directly on Mac OS using your approach. I have got as far as trying the example Blinky project above and get the following build error. Do you have any idea what the issue might be? sa_mtb.c is unaltered from the file included in your zip. Fixed it. Sorry to bother you. gcc and link world not compatible with MacOS directory/filenames that embed spacings. Once those were removed built fine. ### Shall I need to change write in the artifact extension : elf ? This one I suppose it’s just use with the K25. Wich extension shall i use for the K70 ? Thanks again Erich for all ! This is a post build step, intended to create a binary image, in addition to the .elf created by the compiler. For your information, the GNU ARM Eclipse Plug-in provides more configuration options for this step, as for two more additional steps, creating the listing and printing the sections sizes. the problem I found was with include path. I have typed whole path with small mistake(Human Error). and now i have generated .elf file and .s19 file both are not working when i dropped them in kl25z. but no luck i think it is expecting .bin file in default boot-loader. so can you please help me with that? By the way I have looked in your git repository. us. It is great help for engineers like me who are getting started. And your blog posts are really educational. What format (.s19 or .bin) depends on the bootloader. By default the bootloader on the FRDM-KL25Z expects a S19 file, while the FRDM-K64F expects a binary file. I am newbie in arm and you tutorials are very helpful and informative to me as newbie. I followed this tutorial series from part 1.
and I am working in ubuntu 12.04. As per my understanding this is not OS issue. please point out where is my mistake. I hope lots of people commented saying it worked for them so What is it that I am missing. Can you search in your project sources where you have GPIOB_PTOR defined? It looks you are missing to compile/link some files. Same for derivative.h: this one must be found in your compiler include path settings. Anyone know if/when PEx 10.5 is likely to be released ??? I compiled the project you shared, with the help of this article and it is working. I am using kinetis MK20 series MCU and Cross GCC as toolchain. I have copied the EWL_C folder from the Code Warrior installation and pasted it in the Workspace. 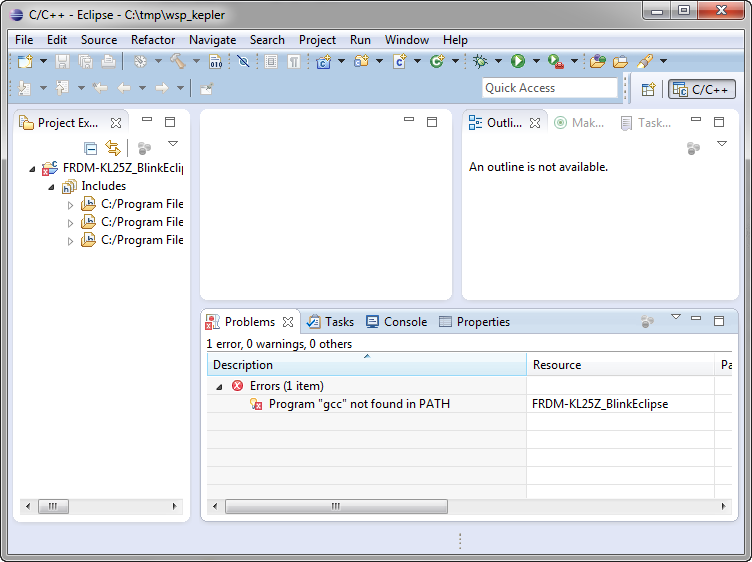 Then I added EWL_C folder path in the Path Include option of the Compiler settings. Yet, I get the above error. Please let me know, how to resolve this. The messages Error: selected processor does not support requested special purpose register — `msr basepri,r3′ indicates that you don’t have the correct processor selected in your project settings, can you verify this? And I would *not* mix things with EWL (and not use EWL at all): using it in combination with the GNU libraries will cause only troubles. I searched in the project settings, but could not find the way to select the MCU. In fact, for the project mentioned in this article, there is no MCU selected either. Please confirm, how to do this setting. What is EWL library and why will make things difficult if we use them with Cross GCC. ‘Cross GCC’ is a generic cross compiler (usually for host systems). You have to use the Cross ARM gcc (https://developer.arm.com/open-source/gnu-toolchain/gnu-rm) for ARM Cortex development. EWL is the ‘Embedded Warrior Library’, proprietary and CodeWarrior compiler specific. It does now work with the standard GNU ARM library which is newlib and newlib-nano. Thank you Erich for quick response. Now things started making some sense to me. The path you shared to select MCU is correct and default selection was M3. I have changed it to Cortex-M4 but the issue of EWL still exist. Well, since I am trying to port my project to open source Eclipse and gcc, I must get rid of EWL also. 1. EWL library functions form the thin layer between my s/w and the MCU initialisation i.e. The activities lying between the power ON/Reset, to the execution jumps to Main(). If I try to remove the EWL, then what would the equivalent files/functions/api in the Cross ARM GCC?? Also, it is quite sensitive region/piece of code. Is there any specific guideline available on how to do that? 2. The srec file/Motorola Hex file that I generated with CW and gcc compiler. Is there any chance that now, I use gcc compiler with Eclipse and generate the exactly same motorola hex file with the same source code??? 1. EWL is a version of the standard library, providing you functions like malloc(), printf(), strcmp() and many others. It is basically a a replacement of the standard ANSI library. The open source variant of this is newlib or newlib-nano which comes with the GNU ARM GCC toolchain. Startup code is a different piece, and it mostly depends on the library used and the linker file. 2. You can generate S19/Motorola files and Intel Hex files with GCC too (see https://mcuoneclipse.com/2014/04/20/binary-files-for-the-mbed-bootloader-with-eclipse-and-gnu-arm-eclipse-plugins/). but as you change the compiler, the files will be not comparable and different. As I understand, that the EWL or NanoLib has nothing to do with the Start up code. Am I correct? I have now blindly removed the EWL component and my code finally compiling. I have copied the startup.s file from the project you shared in this article and pasted it in mine. I have verified the linker file of your project with that of mine. I could find they are by and large same. 1. 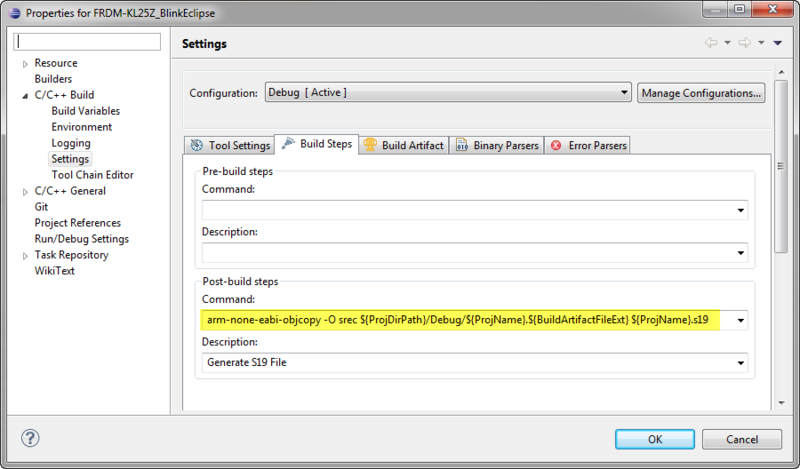 With the GNU ARM Eclipse plugins, you don’t need to run an explicit postbuild step: only check the checkboxes in the project settings (see my previous post). Well, you were right, it is the problem of settings. GNU Linker -> General -> Scripts. I haven’t added the linker.ld file there. Now I added the linker.ld file to it and it is working and generated the serc file. By referring your other post, I have created a batch file that combines this srec file (renamed as .hex) and the bootloader.hex file to generate a merged.hex file. 1. While using CodeWarrior, I chose ARM GCC compiler. And now while interfacing the Eclipse, I used ARM GCC compiler only. So, the hex file generated for optimisation level (Os) must be same. However, the hex files generated by CW based GCC and Eclipse based GCC are different. Moreover, the Eclipse generates the hex file that is 8kb smaller to the hex generated by the CW for same source and optimisation level. How is this happening??? 2. Assuming, the hex file validation is successful, how safe the Eclipse + GNU ARM GCC toolchain will be for future development? I mean, if they suddenly stop providing (Eclipse + GNU ARM GCC toolchain ) or it becomes paid versions or for new ARM MCUs from NXP, there won’t be compatible Eclipse and GCC toolchain. Can you share some comment on this? 2. You can easily store your downloaded setup files in a version control system or a backup system. Plus I recommend to store the whole installation folder, better the whole image of your host PC. Actually for some saftety critical applications, we store the whole development machine (notebooks) in a safe so we can reproduce things years later on. When I programmed the srec file created, I could see nothing happening on the h/w board. so, I interfaced P&E using your article and now I can debug. The startup.S file, I am using, is copied as it is from the project you shared. I put the break point there but it never hit. Apparently, the execution forces MCU to reset in CopyDataInit or LoopCopyDataInit functions. I am using Kinetis MK20 MCU, while you had created project for M0/M3. Please help me identifying the problem. It looks you have the watchdog enabled? I suggest you use the startup code I have used? If I modify this file and jump directly to __init_hardware, the code starts executing. It means the problem lies with startup.S only. Now, since I am using Cortex-M4 and your project (and so startup.S) is for Cortex-M0, I suspect, the as is file may not work. What you say?? 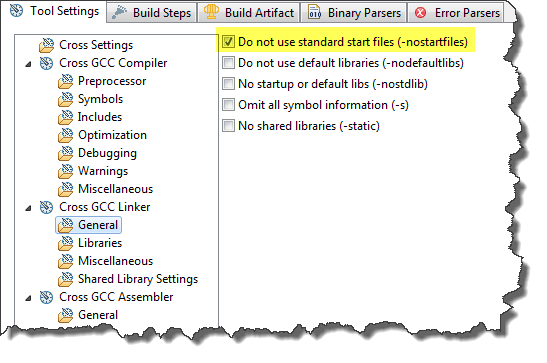 About linker option -nostartfiles , what is the “standard start files”? is it provided by GNU and processor related? Where can I find it? For instance, there’re a startup_MCIMX7D_M4.S in imx7_colibri_m4 project with “bl SystemInit” “bl _start” in it. where are those function come from? meanwhile in this project the -nostartfile option is de-selected. I guess those function were defined in some startfile? I’m newbie, please enlighten me, or link me to some useful site. Do not use the standard system startup files when linking. The standard system libraries are used normally, unless -nostdlib or -nodefaultlibs is used. I believe this comes from the host world where it would use the host operating system startup routines. This does not make sense for embedded targets. 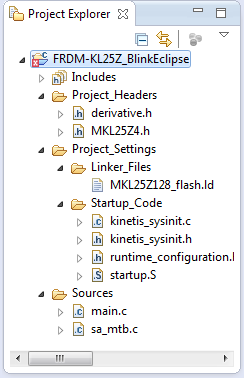 Here usually the tool and/or silicon vendors provide startup files (see as well https://mcuoneclipse.com/2012/11/11/optimizing-the-kinetis-gcc-startup/). This is what you have as startup_MCIMX7D_M4.S. “bl SystemInit” is used to call system initialization (e.g. clock setup, turning on watchdog, etc) while “bl _start” calls the GNU ANSI library startup routine which does memory initialization (zero-out and copy-down) plus calls the global C++ constructors (if any). _start() will call main() at the end. but I didn’t find them. Sounds like it’s inside some binary/obj file? What does the “_start” exactly do? As the Freescale provided .S file (startup_MCIMX7D_M4.S) already finished the job like BSS and data section initialization before the “bl _start” calls. The article of “slimming” is more like a map/big picture for me and very helpful, thank you very much! _start() provided as part of the standard ANSI library. It does initialization of global memory, but as well initializes other library components as global heap needed for example for printf() functions. More important it does call all the C++ constructors for global objects.